Can this 29-inch display do enough to justify its hefty price tag? The NEC MultiSync EA294WMi 29-inch display comes equipped with a 21:9 aspect ratio, which is designed for you to fit more on screen width-wise, such as two documents side by side. Our preferred method of connectivity was via a Thunderbolt to HDMI adapter, but numerous display options are available - DisplayPort, HDMI, two DVI-D and two VGA. There are integrated speakers too, plus a headphone jack and USB hub. The display also supports the MHL display standard for connecting up phones and tablets to the HDMI socket. However, the connectivity options are situated in a recess that faces downwards, so it's not so easy to swap out connections in situ. NEC is generous with the cables, with DVI and VGA cords included, but sadly there's no HDMI lead. The monitor casing is available in black and white, and there's 130mm of height adjustment to play with. The ambient light and human sensors do take things over and above a standard display, but we didn't find the sensor technology particularly effective and preferred to turn it off - the display configures itself to be too dim. And the menu system is like stepping back in time. 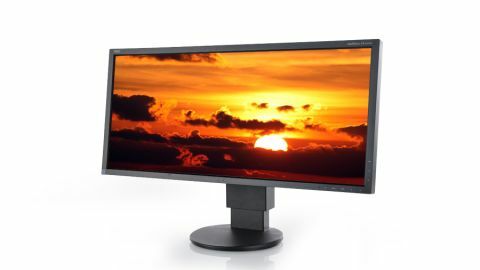 The Philips Brilliance 298X4QJAB also has a 21:9 aspect ratio and is £100 cheaper than this; you'd be silly to ignore its appeal in comparison.